This collection contains images of historic cans assembled by Jim Rock (1942-2010) over his career as an archaeologist with the U.S. Forest Service in Yreka, CA. He compiled information and provided typologies and dating techniques, including examination of seams, closures, openings, materials composition, etc. that have enabled archaeologists and historians to better interpret historical archaeological sites. Unless otherwise indicated, the descriptive information presented with the cans in this collection came from Jim Rock's notes and published works. Links to several of his publications can be found below. 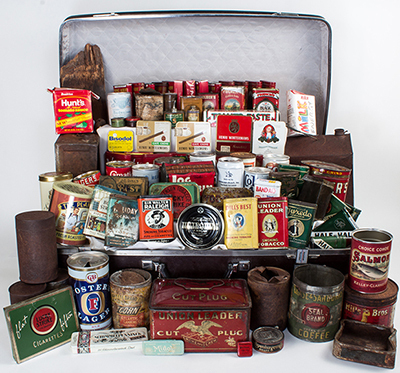 Jim Rock wrapped these cans in wool socks, along with a collection of historic bottles, packed them into suitcases and traveled with them to various parts of the country in order to educate both professionals and the general public about cans and their historical context. A series of note cards were created to accompany this touring collection and highlight specific information about select cans. These informational cards can be found with their corresponding can in this collection, or by selecting the direct link below. This project was made possible by the generous contributions of Mary Ellen Rock and Sandy J. MacAllister. Thanks also to Jeff LaLande, Kyle Crebbin, Mairee MacInnes, and Chelsea Rose.